Lyn is serving the food as Jack comes in and tells them Nina says hi. Lyn says she can't believe he is going tomorrow, and the only thing that's good about it is that it gives her an excuse not to go to Karl and Izzy's wedding. She feels that wishing Izzy and Karl 'all the best' would be hypocritical of her. Steph says that she will be surprised if the attendance is high, and Jack comments about he will be surprised if the bride shows up. Everyone looks shocked and Jack says that it was a joke. Toadie comes over to give Sindi a Christmas present. Its her favourite perfume. He told her that he bought it when they were going out, and she might as well have it as it wasn't really his flavour. She looks guilty and tells him she doesn't deserve it. Toadie asks her what is wrong, and she says she feels bad he was chucked off his case. “Christmas is the time of giving, Tim gave me the boot” Toadie says. Sindi tells him there will be other cases. Toadie says he has to go, and they tentatively hug. After he leaves Sindi looks guilty. Jack is trying to convince Lyn that what he said was a joke, but Lyn doesn't believe him. She asks why he would think that. Jack asks why does she care? Lyn says she doesn't want to see Karl humiliated like that. She asks if Izzy loves Karl, and Jack tells her she does….but she isn't IN love with him anymore. Lyn thinks that Izzy is using Karl, and is seems mildly annoyed by the fact their marriage will be based on a lie. Steph comes into the kitchen and says that Charlie is in heaps of pain. Lyn tells her to call Karl. Stuart comes over to see Sindi, as Scott and Susan are away. Sindi tells him that Toadie came over, and shows him the perfume. Sindi says she cant take it anymore, but she couldn't tell him and ‘kick him while he's down'. They both sit there feeling gutless and guilty, and Stuart asks if they should hold off telling him indefinitely. Sindi says, no, she just wants it out in the open. Stuart says that they have to do what's right for him, but in the mean time they should stop feeling guilty as they are doing the right thing for them. Sindi comes up behind him and gives him a hug. Karl finishes examining Charlie, and then goes into the kitchen to have a word with Lyn. Lyn says she hates to see him suffer so much, and Karl tells her he will up Charlie's painkillers. Lyn thanks him for coming over, and he tells her she is doing brilliantly, and not all of the families would have the strength to cope. Lyn changes the subject to Libby and Darren, then asks if him and Izzy have had a nice Christmas? Karl says he has hardly seen her, due to frantic wedding preparations. Lyn asks how many people is he expecting, and Karl says that a lot of people he would like to come can't including her. She starts to explain about Jack, but Karl says he understands, and hopes that they are friends. He tries to buy her attendance to his wedding gives her a voucher for a gourmet food shop as a Christmas present, and makes it clear to her that tomorrow is the first step into the future for him. Lyn and Susan talk about Libby and Darren, and then Lyn tells her Karl came over to see Charlie earlier. Lyn asks what she has planned for tomorrow. Susan says she is going to a day spa. Lyn says “the further away from here, the better. It may not be pretty”. Susan asks her what she means. Lyn is very reluctant to gossip, all of a sudden, but eventually spits out that Izzy told Jack she doesn't love Karl. Susan looks at Lyn in disbelief. Susan says that it shouldn't matter to her whether or not Izzy loves him, and that she wishes that Lyn hadn't told her. Lyn says that Karl could really get hurt, and he doesn't deserve that. Susan grudgingly admits he doesn't and they joke about Susan running into the wedding and shouting ‘I object'. Lyn suggests Susan should talk to him. Susan says that he made a decision and he has to live with it, and she will not be responsible. Lyn, Steph and Doreen fuss over Charlie, and he exclaims that he is still in the room. Steph says he needs to conserve his strength, with a grin on her face. Charlie asks what they are up to. They just smile at each other, and Lyn tells him to take his painkillers and have a nap. Karl is on the phone to Izzy, telling her that with the small amount of guests they might need a smaller venue, which doesn't seem to go down well. Toadie, who is playing darts, comes over to Karl and comments on his stressed face. Toadie notices the small guest list and says that really there is only one other person who needs to be there. 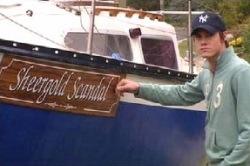 Sindi and Stu comes in, and Toadie asks if he will be at the wedding. Stu says he can't as he is working, and apologises to Karl. “Sindi will be there though,” says Toadie. Sindi looks a bit put out, but hesitantly agrees to come. David then rings to confirm him and Lil are coming too. Lyn is drawing up a whiteboard schedule for looking after Charlies' needs. Steph asks what happens if he gets worse. Lyn says Karl will prescribe him more painkillers. Steph asks what if they just stop working altogether. Lyn tells her she is forgetting that he might actually improve. Steph says she just hates to see him hurt. The next morning, Sindi comes out of her room and checks that the coast is clear, then Stu comes out of her bedroom. He complains that he feels like a teenager again, and Sindi teasingly asks if he did this a lot when he was a teenager. He says he has to go, and she asks if they can have “more of this later?” Stu says “not too much later”. They start kissing, and Susan comes in. Sindi and Stu spring apart guiltily, and Susan looks disapproving. Sindi is trying to explain to Susan that it was just one of those things that happens in life. 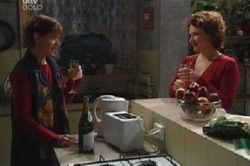 Susan asks when they are going to tell Toadie about it, and that they'll have to eventually. SINDI: You're not very impressed with me, are you? SUSAN: You don't need me to tell you what right and wrong, you already know. Susan goes to leave for the spa, but she tells Sindi that at the very least, friendships are going to be damaged. “Yes!” Sindi says in frustration, then goes back into her room. Lyn wakes Charlie up and tells him they ‘need help' outside. Steph and Doreen help him down the driveway, until he can see his boat. He looks really happy. LYN: Now do you see why we needed your help, none of us know anything about boats!! The Scullys are saying good bye to Jack. Charlie tells him not to muck up, and have a safe travel. “You too” Jack says, and they hug tightly. He kisses Doreen goodbye, and she tells him not to spoil his “strapping young body with American junk food.” He goes to hug Steph goodbye, and tells her he won't let her down. Lyn calls from the car telling him to hurry up. He says goodbye to Oscar through the baby monitor in Steph's hand then gets in the car. 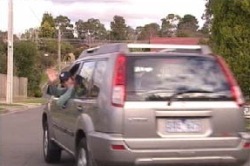 The car drives off and Jack waves back to Steph, Charlie and Doreen. Susan comes in and goes over to Karl at the counter. They talk awkwardly for a few minutes about what Susan will be doing that day, and then Karl goes to leave. Susan calls him back and says she has something to tell him about Isabelle.